And I’m not even done yet! I have another post coming up later about getting my sister’s Thunderbird back on the road, and I promise there will be some Saab updates too, but I wanted to show you guys these brake lines. You see, here in Michigan we don’t have yearly vehicle safety inspections (some commercial vehicles get a regular DOT inspection, though). Salt is a way of life, so we certainly don’t go condemning every brake line that happens to have some rust on it. No, there’s a big difference between surface rust, and a flaking section of tubing that’s about to pop. And this one sure as hell popped. It is a MIRACLE this bleeder screw came out. I was sure that it was going to shear in two. 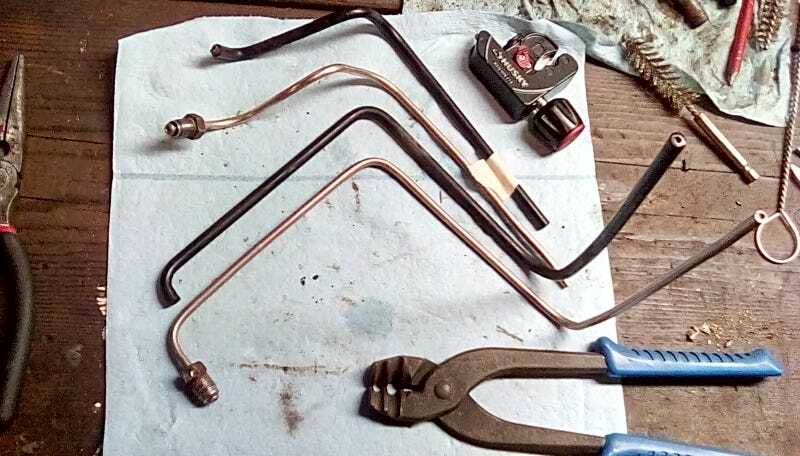 But after some wire brushing, penetrating oil, propane torching (I don’t have oxy/acet), and “Freeze-Off” to cool the bleeder back down, the Vise Grips managed to twist the whole thing free. I guess this caliper isn’t getting replaced quite yet after all! Ran into a problem, though, and this is why the truck’s still out of commission for the moment. The plan was to splice some new NiCopp into a serviceable section of original steel line, but my flaring tool’s press pushed the line right through the clamp without flaring it. This pic is actually just a test piece, though. The section that has to be flared is still on the truck, but I was using this junk piece to teach my brother how to flare brake lines, and I wanted to show him how to do steel ones before moving on to the NiCopp. Either the clamp is still gripping too much rust and letting the good steel slide by, or My cheap flaring kit is a little too cheap. I’ve got a hunch that it’s the tool, and I probably need a clamp with better-machined non-chinesium grooves in it. This one has always worked just fine, flaring NiCopp like a champ, and even 3/16" steel tubing. This is the first time I’ve tried to use it on 1/4" steel brake lines before. Maybe it’s time to move on from this kit. Not sure I’m ready to drop $50 or whatever on a nicer one, though. So the conundrum that I’m faced with is this: Should I pony up the cash for a real quality flaring tool, or should I try releasing the rest of the brake line from the truck, and replace the entire length with NiCopp? I was going to splice into the line in the engine compartment, but if I do the whole line, I have to go all the way to the ABS module, and if I go there, I’m afraid I’ll bump one of the other lines. Really, ALL of the lines should be replaced anyway. I sure would, if it was my truck.